Comedienne Ruby Wax is a lifelong depression sufferer and the poster girl for mental illness. She had to ‘mind the gap’ on the London Underground when confronted with giant posters of herself labelled This woman has mental illness, please help her. “So I wrote a show to make it seem like that was my publicity poster,” she quips. 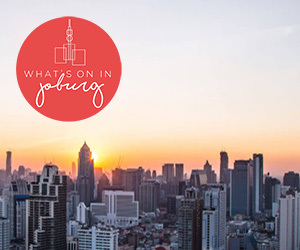 The resulting show, Out of Her Mind (previously billed as Lost It in Cape Town) has just come to the end of its world tour in Johannesburg, paving the way for her brand new follow-on show, Sane New World which kicks off in Cape Town later this month. Out of Her Mind is a send up of ‘busy modern life’ and ‘the cult of celebrity’ – both contributing factors to Wax’s bouts of depression. In a series of anecdotes peppered with her often wry observations Wax shared her public breakdown at a school sports day and her rehabilitation, which included mandatory salsa classes regardless of age or physical agility (and bless her she salsa-ed for us which was fabulous). Wax questioned how we are supposed to navigate modern life without a manual instructing us how to manage the negative internal voices constantly criticising and second-guessing us – the factors which tip one in four people to succumb to mental illness. It was alternately seriously funny and just plain serious with Wax opening the floor to questions after the interval. Some of the dialogue was disjointed as she flitted between subjects and buzzed about the stage. Although reflecting her mental turmoil, it was at times difficult to follow. Wax’s humour is both self-deprecating and brash (she is American after all) and she can also be quite crude and bitchy, which is clearly not to everyone’s taste. In fact I noticed a handful of empty seats after the interval. Perhaps it was because the show was not the Ruby Wax that most of us are used to seeing on television, or perhaps it was because much of the content is so painful. Either way it was a shame because in her Q&A sessions Wax draws the threads of the performance together and reveals a more vulnerable and lovable side. Ms Wax couldn’t find the life manual she so clearly feels she needed, so she wrote her own. Having gathered her scattered marbles and tucked a Masters in Mindfulness and Cognitive Behaviour (from Oxford University no less) under her belt she has launched her book Sane New World and is now bringing the eponymous and brand new live show to Cape Town. Out of Her Mind was all about the statistical ‘1 in 4’ who suffer mental health issues. Wax said “I moved to the UK to get away from all the crazy people. It turns out I’m one of them.” “But then everyone I know is nuts,” she smiled. All of us (the ‘4 in 4’ statistic) have to endure the constant chatter and twitter of 21st century life. Sane New World charts Wax’s move from mindless to mindful as she shares her techniques for rewiring your brain and calming your inner thoughts. With Sane New World, Wax is set to quip and anecdote her Cape Town audiences into a state of mirth and if the original show is anything to go by she will handle quite dry and serious subject matter in an entertaining, accessible and thought-provoking way. (Oh yes -and I can just about guarantee she’ll mention her degree from Oxford). Ruby Wax in Out of Her Mind was thoroughly enjoyable, funny and touching. So take three friends to see Sane New World. It is guaranteed to be mind-altering entertainment and 1 in 4 of you might find it particularly helpful. 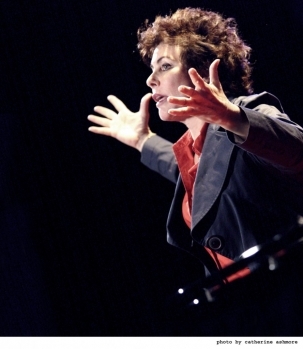 Ruby Wax’s Sane New World runs at the Theatre on the Bay 29 January to 15 February 2014.